This is my 12 yr old son, Aidan. 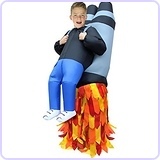 His costume this year was a jet pack illusion. We wanted to be creative and make his costume, so we scanned the internet for unique ideas. After sifting through hundreds of ideas, we kept coming back to this. 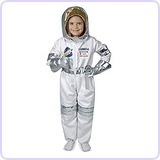 Aidan loves space, fire, and trickery, so this was the perfect choice for him. Jet pack: cardboard concrete mold tubes, duct tape, spray paint, paper plates, backpack straps, reflection tape, lights/switch. Flames: red skirt, 1 yard each of light yellow, golden yellow, orange, and red fabric, thread or adhesive. Fake legs: project foam board, duct tape, pillow stuffing, girls' tights, boys pants, tennis shoes. Miscellaneous items: clothes for the real body, spare shirt with hole cut in back, straps, belts, or suspenders for underneath fake outfit, clips or pins for attaching legs. Assembly was trial and error, so this may not work for everyone. It is very customizable though. This costume took me a week to figure out from start to finish, and we ran out of time for more details. However, it was the ultimate hit and people responded so positively over it everywhere we went. There was even "paparazzi" as my son described it. For the jet pack, I cut the 8" diameter tube in half, then cut about a third off of each one lengthwise. The two tubes were joined together using the two pieces that were cut off. These were duct taped together. A large hole was cut on one side so his body could fit through. I attached two backpack straps to the jet pack. The tubes were painted silver and paper plates were glued on top. I drilled some holes for added lights and a switch, and made a label for the speedometer. For the flames, I bought a red skirt at a thrift store and sinched the waist. I cut flame-like triangles out of the fabric and used them and the remaining strips to sew onto the skirt in rows from darkest at bottom to lightest at top. I also added a couple flames to the top of his tennis shoes for camo purposes. For the fake legs, I traced his real legs onto poster board, then it cut out for a template to trace onto foam board. I traced both the side of his leg and the top, so I was able to piece them together to make it 3D. At first I didn't duct tape the foam, I just stuffed them into tights with pillow stuffing, but the foam broke, which resulted in sickly looking legs. So I re-did the legs with duct tape to hold them together well, then stuffed them in the tights with pillow stuffing to shape what looked like real legs. I put these fake legs in pants and put shoes on the end of them. The legs are really the most important part because if they don't look real, the whole costume looks bad and the illusion is gone. If the legs truly look real, people will be very confused as to how you are floating and who could possibly be holding you up. The assembly... tricky. The shirt that goes on your body that's visible has to have a hole cut in the back for the body to pass through. The pants will attach in the front, inside the bottom opening of the shirt. You are on your own here, I scrounged around until I found just the right combo (which was caribeaner clips, an old purse strap, a belt, and safety pins). The result is what looks like a person floating in the air over a plume of flames coming from the bottom of a jet pack. People LOVED it. Many told us it was the best costume they'd ever seen. There were people staring, laughing, and taking pictures all evening. Awesome job! Very unique and lots of great details. Instructions are well written and can be followed. 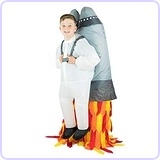 All boys love a jet pack, super cool idea! This is the BEST costume I have ever seen, and I have seen a lot in my 60 years!! Awesome job both of you! I had to look very closely to figure out this costume-- the illusion was that good!! Great job! 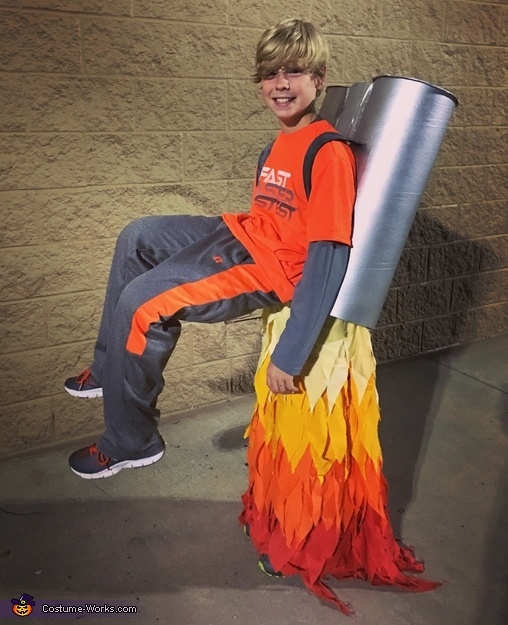 This costume that Aiden Smith (made by Alana Smith) is wearing ia absolutely awesome !!! She is a genius.